I have been tasked to identify the following two swords. My in-laws have an elderly woman leaving for a senior's residence and is clearing out some of her late husbands articles. He has acquired these swords about 25 years ago and I am supposed to i.d. them and perhaps come up with a price value, and perhaps sell them for her. 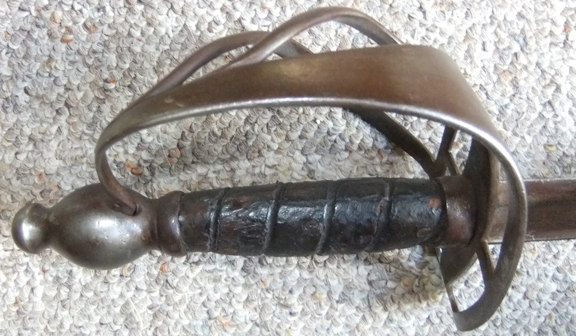 Sword #1 is, I believe, an early 1800's Scottish Sergeant's sword, with scabbard. Sword #2 I'm guessing is British and from same period, no scabbard. Any help from members would be much appreciated. These are the two. Blades are 32" long. Minor damage and pitting, etc. Got a few more here to help. Note that there are no markings on any of these pieces. 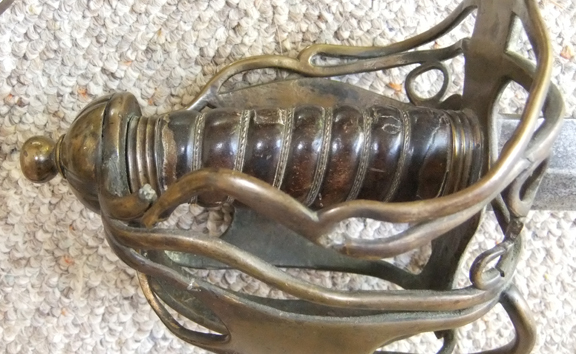 The steel mounted sword is a British 1788 pattern heavy cavalry sword. I am sure some of the basket cases here can confirm the sergeants sword. Would you or anyone else know the approximate value of these? I do not want to put them on ebay and go through all that hassle. The 1788 is a fairly uncommon sword on the market. I have seen one with scabbard listed close to $3000 but have also seen them sell without a scabbartd in the lower 4 figure range.. The high price was was listed a couple of years ago by Michael D Long ltd of England. Past sales are really the best judge but these turn up infrequently. IIRC, the last I saw sell on Eabay went at about $1200 but I don't have the old listing handy. Thanks everyone. Nice to hear from folks who know! Got to jump in - that steel hilted sword is NOT a 1788 pattern heavy cavalry sword; it is pre-1788. The 1788 pattern has 3 side branches on both sides of the slotted guard. The length from base of grip to top of the pommel is about 7.5 inches. The 1788 pattern blade is 1 1/2" wide, and 3/8" thick at the forte. There are a lot of shortened blades out there, but the specified length for the 1788 was 38". Standard fullering was one wide fuller, but you can find them with the narrow and wide combination. I have in my collection both a 1788 pattern sword and the type pictured in this thread: the 1788 makes the pre 1788 look like a toothpick (sort of...). It has been pretty common over the last decade or so for dealers to claim that their pre-1788s are actually 1788 patterns. Why? One reason is that a true 1788 is a very rare bird; the pre 1788s are much more common, and therefore don't bring as much money in. Another reason is because of a partial reading of Richard Dellar's book where he discusses whether or not these pre-1788s are actually 1788s. However, in the conclusion of the discussion (which most people seem not to read or refer to) he maintains that the true 1788 pattern has the dimensions that I mention two paragraphs above. Robson's book also concurs with this. Documentation for my post above. First, a brief discussion on SFI over the identification of an English cavalry sword. Second, also an SFI thread, in which Richard Dellar has some pertinent observations. Third, an article by Richard Dellar which discusses 1788 pattern swords. Yes, the article from Richard sums it up pretty well.. I guess its kind of like distinguishing between proto 1796 infantry swords and the examples that appeared before (except in numbers). Thanks for checking in you guys.